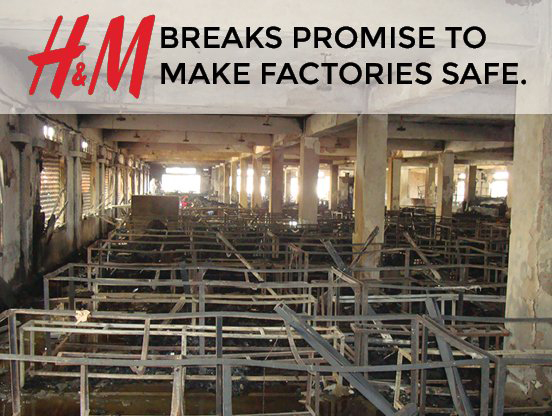 Labour rights groups in Europe, Bangladesh and North America are demanding that H&M finally keep its promises to make its Bangladeshi supplier factories safe. In the run up to H&M’s 2016 Annual General Meeting in Solna, Sweden on May 3rd, labour rights groups are increasing pressure on the fashion brand. A review of corrective action plans relating to 32 of H&M’s strategic suppliers, carried out this week, shows that the majority of these factories still lack adequate fire exits nearly three years after H&M committed to improve working conditions by signing the Bangladesh Accord on Fire and Building Safety. 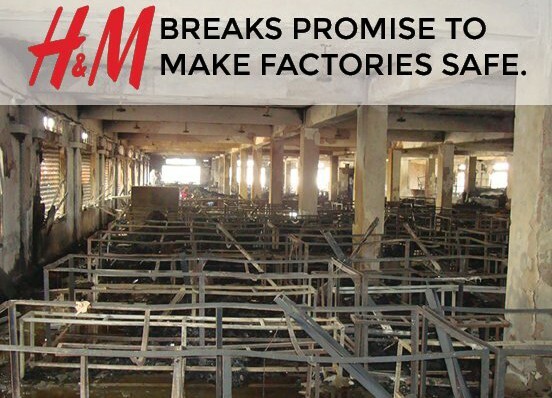 As a response to H&M’s inaction, the Clean Clothes Campaign, International Labor Rights Forum, and United Students Against Sweatshops have launched a campaign demanding H&M address its broken promises, with a campaign website, www.hmbrokenpromises.com. 1. Labour Behind the Label is the UK platform of the Clean Clothes Campaign. The Clean Clothes Campaign (CCC) works to improve conditions and support the empowerment of workers in the global garment industry. The CCC has national campaigns in 15 European countries with a network of 250 organisations worldwide. Please see http://tracking.etapestry.com/t/31653218/1183091806/58958327/0/90567/ and http://tracking.etapestry.com/t/31653218/1183091806/59222928/0/90567/ for further information. 2. Labour Behind the Label will be organising a shop action alongisde War on Want in London outside H&M’s Oxford Street shop in the week running up to the Rana Plaza anniversary. For more info please contact Anna McMullen: anna@labourbehindthelabel.org. 3. There will be store actions taking place across Europe and North America on 3rd May outside H&M stores to coincide with H&M’s AGM. For more info on where an action is taking place please see: www.hmbrokenpromises.com.